Why do we need a new building? Isn’t the old one good enough? We have outgrown the old building. We have more staff and more responsibilities than we did when the building was new. The building is not ADA compliant. It is not accessible. Have you looked at other alternatives? Yes. About 9 years ago a committee made up of people with expertise in real estate, construction, and office efficiency researched remodeling the current building, moving into a local congregation, renting commercial office space or building. The unanimous conclusion was to design and build a new building to meet current and future needs on the lots we already own. What about the newly-available New Hope building in Great Falls? Wouldn’t it make more sense to use an existing building and model partnership? All options were looked at during the long process of getting where we are today including renting space in other churches. With the recent resolution with New Hope and their building, the synod was approached by them. When reviewing their available space and the needs of the Synod office, the council and staff felt we’d be trading one inadequate space for another and the decision was to continue to move forward with our project. How much money do we already have? Current total includes $182,178 from the Kraftenberg fund and $50,000 cash transfer from the synod gives you the total money raised. Currently the account is approximately $280,000 in cash and pledges and that amount is growing daily. Are you planning to borrow money? We have preliminary loan approval but we want to raise most if not all the necessary funds via the capital campaign. If not, a loan with M.I.F. may be necessary. Why don’t you tithe what you raise? We are tithing 10% of the capital campaign to the Mission Venture Capital Fund. Aren’t we living in a post-brick-and-mortar era? Why a building at all? 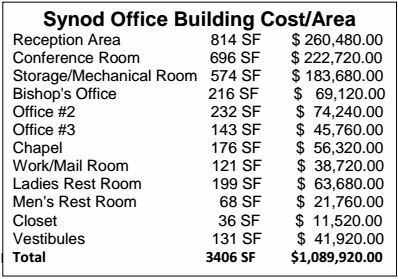 They synod needs a building that can facilitate many things. It needs to bring together staff to promote teamwork, communication and the logistics of assisting congregations in their work. We need a facility that represents the extremes from being environmentally responsible to technologically advanced. Our goal is to move us into the 21st century so that we can reduce travel by use of modern communications, facilitate meetings and provide confidentiality to all just to name a few.